The practice problems in 1001 Basic Math & Pre-Algebra Practice Problems For Dummies give you a chance to practice and reinforce the skills you learn in class and help you refine your understanding of basic math & pre-algebra. 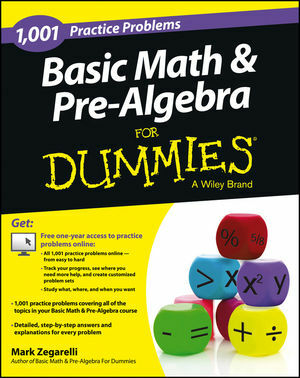 Note to readers: 1,001 Basic Math & Pre-Algebra Practice Problems For Dummies, which only includes problems to solve, is a great companion to Basic Math & Pre-Algebra I For Dummies, which offers complete instruction on all topics in a typical Basic Math & Pre-Algebra course. Mark Zegarelli is a math and test prep tutor and instructor in SanFrancisco and New Jersey. He is the author of Basic Math & Pre-Algebra For Dummies, SAT Math For Dummies, ACT Math For Dummies, Logic For Dummies, and Calculus II For Dummies .